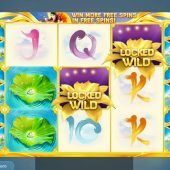 Golden Lotus slot, as the flower may indicate to you, is another Oriental-themed game. But then again Red Tiger do specialize in the Eastern subjects for their output, as their name infers and indeed we have seen before with their Jade Charms and Lion Dance efforts. We have the reels set against a frame of golden sculpture and the music is the standard pipe-and-cymbal strains which tend to accompany the majority of slots using this theme. So will the Golden Lotus make your balance bloom? The game uses Red Tiger's usual format of 5 reels consisting of 3 rows and 20 pay lines with stacked symbols and in-play events to keep you entertained before the bonus round is triggered. There are the card values defined by nicely sculpted Oriental letters and these are the low values paying 1 to 2x your bet for a 5-of-a-kind win. The Pagoda is the best at 3.75 as are the Goldfish and Lily icons which also pay 3.75x stake for the 5. So the pays are quite simple, but what about the Wilds? The Wilds are in fact the Golden Lotus which appear on a purple background and are sticky whenever they land. They will open and produce pollen particles which indicate the amount of paid spins they will remain in place for. This can be for up to 10 spins but is usually 3-5. Never fear, as we have an in-play random feature whereby the background turns purple and Pink Petals may rain down on the reels adding more Pollen to any sticky Wilds to retain them longer. The Wilds are also the highest pay at 32x bet if you manage a full line with 5 on and come in far more frequently than they will on Creature From The Black Lagoon for example. The last symbol to be mentioned is the game's scatter. This is in the form of a beautiful Princess with the Golden Lotus in her hair and appears singly on all reels although only 3 are required to earn 10 free games. There are no retriggers but you do get 1 extra spin for every scatter that lands during them which could be lucrative as in this round every Wild will now be sticky for the duration, like with Netent's Dead or Alive game.